Can I Play Lotto 5 Online? Read Reviews! Lotto 5 Aruba Exposed — Why Not Test Your Vacation Luck? We love 5/35 lotteries, do you know why? They come with amazing odds of claiming the jackpot because of the smaller numerical pool to choose among. This is one of the main reasons why Lotto 5 from Aruba is an excellent idea. A rather simple game that doesn’t feature too many bells and whistles, Lotto 5 is definitely worth a try if you’re currently in Aruba. Here’s the inside scoop about this lottery. Lotto 5 is one of the games in the portfolio of E Loteria di Aruba. Today, it’s one of the most popular games in the country because of the simple format, good odds and the guaranteed minimum jackpot. The lottery has two drawings per week – on Wednesday and Saturday. Both of them are televised and broadcast live. Whenever the jackpot reaches a higher sum due to multiple rollovers, the televised drawing enjoys a relatively high viewership. Can you blame people for wanting to know immediately whether they’ve become millionaires? Is Lotto 5 a Scam? This lottery is a part of a national portfolio of games, all of them organized by an official entity. The official entity is called E Loteria di Aruba and it’s been around ever since 1982. When it was established, the organization had one primary goal – to provide funding for sports, cultural development and other charitable causes. Since those early days, the portfolio of E Loteria di Aruba has expanded significantly. Today, it includes a number of popular games apart from Lotto 5. These include Big 4, Catochi, Zodiac, Lotto di Dia and Mini Mega among multiple others. Scratch card games are also available for those interested in an instant win. 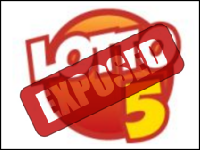 Lotto 5 is completely legitimate and the fairness of the draws is guaranteed. If you happen to be in Aruba, you can give it a try and test your luck without worries about negative consequences. Playing Lotto 5 is incredibly simple because the game has one of the most basic formats out there. All you have to do is choose your set of five numbers in the range from one to 35. If you don’t feel like choosing your own digits, you can have a randomly-assigned ticket when you go for a purchase. Apart from featuring good odds, the game is also quite inexpensive to play. A single ticket costs four Aruban florin, which is the equivalent of 0.56 US dollars. Lotto 5 drawings take place on Wednesday and Saturday, at 9pm. Ticket purchases for the respective date are discontinued 15 minutes prior to the start of the televised drawing. If you miss the official broadcast on Tele Aruba, you can get your results from the official E Loteria di Aruba website. These are published immediately after the drawing takes place. To win the jackpot, you have to match all five numbers for the respective drawing. The odds of this happening are 1 in 64,926, which is more than satisfactory in comparison to what some other national lotteries have to offer. Lotto 5 comes with a minimum guaranteed jackpot. The top prize starts at 100,000 Aruban florin (55,865 US dollars). If there’s no winner for the respective drawing, the sum will roll over towards the next one and increase in the process. Keep in mind this isn’t the E Loteria di Aruba game that produces the most impressive jackpots. If you’re in the country and you’re interested in a more serious jackpot, you may want to consider options like Mini Mega and Lotto di Dia. Other than the jackpot, there are four additional prize tiers. People who match four of the main numbers and the joker will get their hands on the second prize. The second prize tier is a percentage of the sum generated through ticket sales for the respective drawing. The amount is split evenly among all of the individuals who have the correct digits. The fourth prize tier is handed to those who match 3 numbers. These players will win 12 florins. The lowest prize tier results in a prize of a free ticket, which definitely isn’t a bad reward! Players have 90 days from the date of the drawing to make a prize claim, regardless of the sum that they’ve won. A signed ticket and a valid national ID must be presented at the venue in order to make a prize claim. Prizes of up to 500 florin can be requested at just about every authorized retail venue throughout the country. Larger amounts are to be claimed solely at the lottery head office. The lottery in Aruba has the right to present information about the name of the winner and they could also request a photograph after the prize is claimed. In the country, the anonymity of lottery winners is not maintained. Keep in mind that Aruba has a gaming tax that applies to money won in the casinos and through other gambling activities. Lottery tickets are exempt from this taxation regulation. If you’re a foreign citizen who has won a Lotto 5 prize in Aruba, you may still have to pay local taxes upon arrival back home. It’s a good idea to check the regulations prior to heading home. Can You Buy Lotto 5 Tickets Online? Lotto 5 in Aruba is a fun little game, but currently, there are no online ticket buying options. The official website of the lottery doesn’t allow online purchases. The game isn’t available through international lottery agents so if you want to participate, you’ll have to be on the territory of Aruba. Would you mind rating Lotto 5? While Lotto 5 doesn’t offer many exciting quirks, it’s still a solid game. If you’re on a vacation in Aruba, you should definitely give it a try. Low ticket price justifies this test of luck. If you’re ok with these negative characteristics, you should definitely give Lotto 5 a chance. What could be better than going on a vacation to Aruba and coming back home at least a little bit richer? Do you already have such an experience? Don’t hesitate to share the information with us!